“Your family is so lucky, they probably get the best dinners every night!” That’s often the reaction I get when people find out what I do. I can’t help be wildly bemused when I hear such an assumption. I don’t challenge the first part, they are lucky, but the second clause can’t be further from reality. Sometimes I nod and smirk, delighting in the fantasy and the speaker’s perception of me. Sometimes I clue them in that nope, my family often gets the simplest fare because it’s all I could offer them when the crossroads between time, each one’s personal taste, what’s in stock, and my mood converge. Don’t get me wrong, I love good food but cooking doesn’t happen every night. The ritual of feeding my family can, on some days, drain me and often I’m stumped with what to make. It happens more often than I care to admit. But that’s also because my creativity gets channeled with projects and work that’s unrelated to dinner plans though not always. When work projects becomes dinner, I am happiest and most productive and that’s usually when you’d be invited over. To see the good parts. For all the other times, I fall back on eggs, leftovers, or even sandwiches. 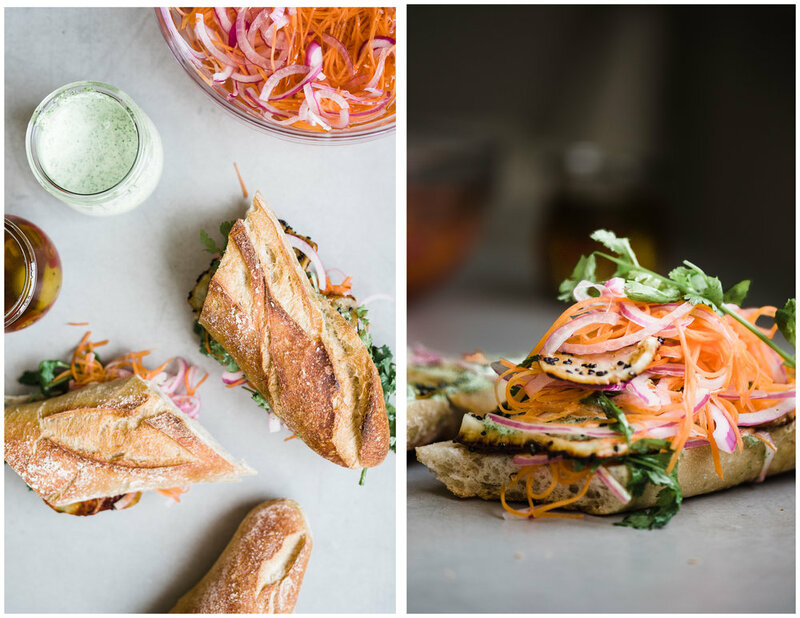 I love a good banh mi sandwich. 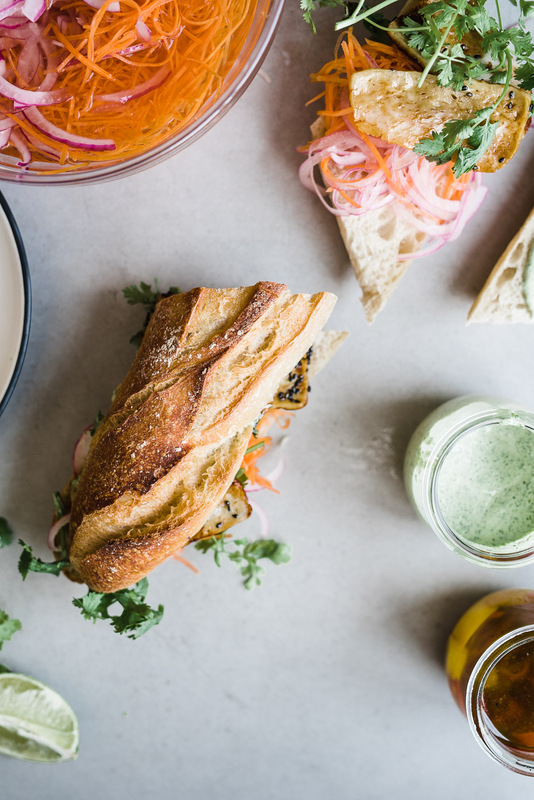 It relies on a heaping of herbs and vegetables, julienned to perfection and pickled for a fresh crunch that contrasts the soft crumbed, crusty baguette and gives a most satisfying bite. A slather of the green sauce, which I think you should stock because you might want it on demand as soon as you taste it, brings things up a notch. And the chili oil, which I used for a mild spicy can be swapped with a few coils of chili pepper. Let’s talk protein. I used haloumi pan fried in soy and maple syrup because I love the flavor against the salty cheese. And it’s also a preference over tofu. If you’re going the meat route, you can grill some chicken or thinly sliced steak. It all works. Sandwiches are reliable like that. In a large bowl combine all the ingredients and let sit for at least 1 hour, covered, at room temperature. Store in the fridge until ready to use. Heat a large skillet over medium heat. Add the oil and let it warm up for a minute. Pour the soy sauce and maple syrup and fry the halloumi slices for 2-3 minutes per side or until lightly browned. Add the sesame seeds and transfer to a plate. If your skillet is smaller, work in batches until you’ve fried all the halloumi. In a small chopper, blend all the ingredients until smooth. Transfer to a jar and keep in the fridge for up to 1 week. To assemble the sandwiches, you can lightly toast the bread depending on how fresh it is and your preference. 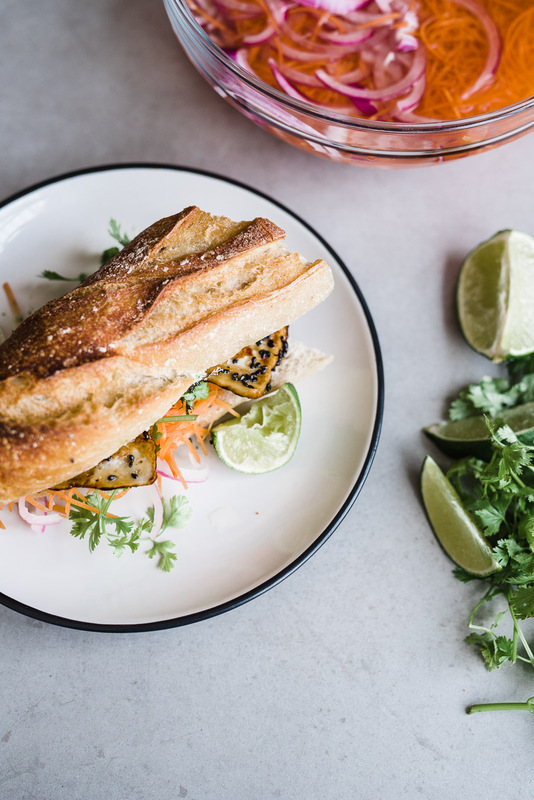 Smear a tablespoons of green sauce on one side, top with halloumi slices, pickled vegetables, and cilantro. Drizzle some chili oil and close it off with the other slice of bread. Enjoy, stat.